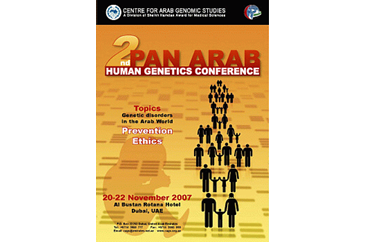 The Centre for Arab Genomic Studies is pleased to welcome you all to the 2nd Pan Arab Human Genetics Conference (November 20-22, 2007) in Dubai, United Arab Emirates. Genetic disorders and congenital abnormalities continue to be serious issues faced by healthcare providers in the Arab World. Fortunately, genetic research is evolving very rapidly in the region. On the one hand, this is expected to translate into reduced incidences of genetic disorders, early detection of these disorders, and better treatment and management strategies for those found affected. On the other hand, the surge in genetic research has also led to the cropping up of several serious ethical concerns, dealing with premarital genetic testing, prenatal diagnosis, newborn screening, genome mapping, and the recent international initiative to study human genomic variations. The First Pan Arab Human Genetics Conference, held in April 2006 in Dubai, went a long way in bringing together experts in genetics from the Arab world, as well as from abroad, to set the priorities for research on genetic disorders in the region. With the Second conference in this series, we hope to be able to provide a platform for education on common genetic disorders in the region as well as the applied methods to control and prevent them. The conference will also host a forum for dialogue on ethical issues in genetics related to the Arab World. The Scientific Program of the conference includes 30 lecture and 83 poster presentations. Abstracts have been received from 31 countries, namely: Algeria, Australia, Bahrain, Denmark, Egypt, Finland, France, Germany, India, Iran, Iraq, Japan, Jordan, Kuwait, Lebanon, Malaysia, Maldives, Morocco, The Netherlands, Oman, Pakistan, Palestine, Qatar, Saudi Arabia, Spain, Sudan, Switzerland, Tunisia, UAE, UK, and the USA. This is an important indication for the potential of human genetics research in the Arab World as well as the awareness of the international scientific community to establish collaborations with research groups in the region. 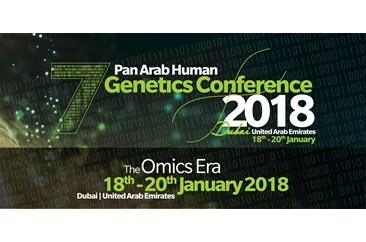 The 2nd Pan Arab Human Genetics Conference is accredited by the Faculty of Medicine and Health Sciences, UAE University as the equivalent of 11 CME hours. A consice breakdown of the CME hours according to the conference sessions follows. An advanced barcode scanning system will be used to register the attendees during each session. Individuals who fail to present their badges during the attendance control period will lose the CME hours for the respective session. Certificates of attendance and CME hours collected will be distributed by the end of session 6 (afternoon of 22 November 2007) to participants who successfully submit their completed conference survey forms.